It had been a while. I kind of missed the pain. 1 - how many does this make? 2 - is this specific design sigficiant? Depends on how you count. I say 3: sleeve up to left pec, half my back and now right calf. No significance other than I saw the design on a banner and wanted it on me permanently. 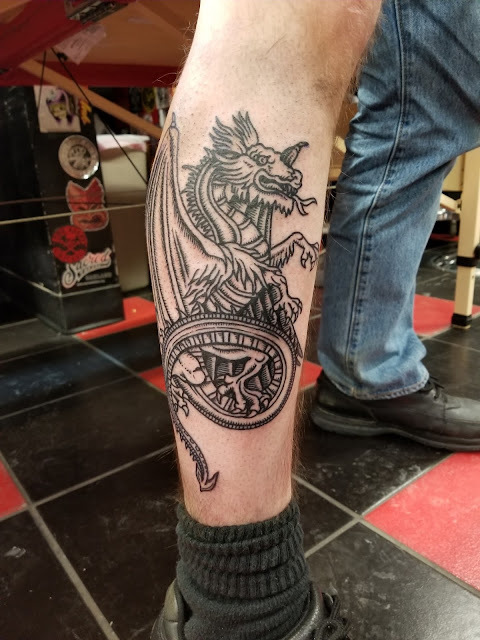 To me it's like the dragon on a knight's shield, or an olde-timey nautical map. "Here be dragons."